Clinic Director, Mark Fisher, explains what’s on tap for the evening. Nature imposed it’s will on Thursday, June 22nd just before the official ending of the clinic bringing down the curtain just a little early, but it didn’t dampen the spirits of the 35 rising 6th – 12 graders who came out for the 4-day clinic. 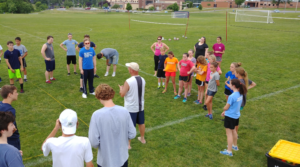 The last day consisted of continued instructional activities, several contests and some great games as the clinic players were joined by some high school and middle school volleyball players for some spirited and friendly competition.